Departing President from China, Mr Wang Shen, addresses the General Assembly under the dazzling ceiling of the Abbasi Hotel. The 18th General Assembly of the World Craft Council has just met in Isfahan, Iran. Every four years the members gather to celebrate craft, consider pressing issues and elect a new president. It was Europe’s turn this time and Rosy Greenlees, the Director of Crafts Council UK, stepped forward to take on the responsibility. WCC-Europe has been very active of late, extending its engagement across the continent. This Presidency promises to bring increased dialogue, for sure. However, we are unlikely to witness in this upcoming term the kind of generosity exercised by the Chinese in bringing the world of craft together, as they did in Dongyang, 2014. But there are many other ways of being effective than hosting grand global spectacles. This year’s General Assembly was focused mainly around the World Cities of Craft program, where cities are recognised for their preeminence in a particular craft. India, China, Iran and Chile have been particularly active in nominating cities (Iran’s cities feature in the latest issue of our Garland magazine). The challenge now is to develop networks between cities so that they can build exchanges on top of their individual activities. 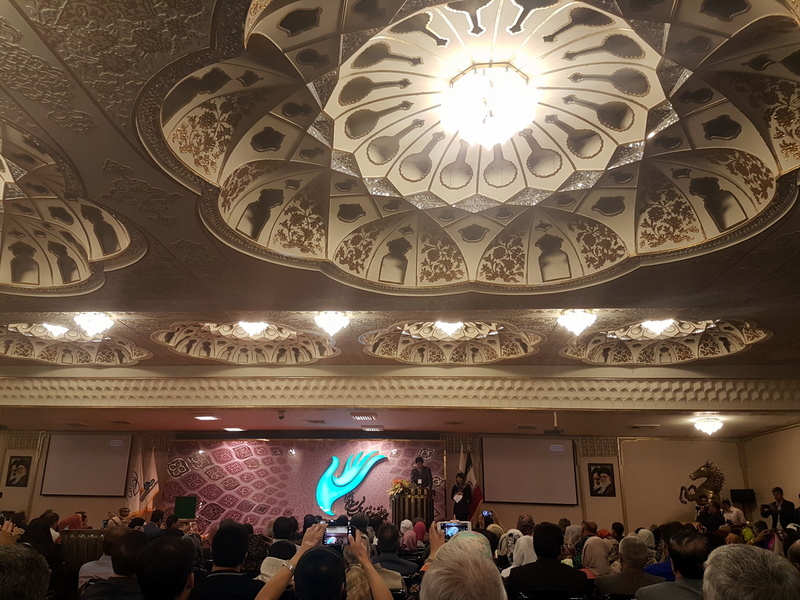 The four-day event occurred in the splendid surrounds of the Abbasi Hotel, in the majestic Isfahan. This seemed to encourage much ceremony and quite a few marathon speeches (with translations!). The highlight was no doubt the enthusiasm of the hosts. It was difficult to walk more than a few metres in any direction without being called upon for an interview, a selfie, or just a heartfelt smile. The pride in hosting this international craft event was palpable. It may well be the most important international event hosted by Iran since sanctions started being lifted with the recent nuclear deal. In Australia we don’t quite realise the importance of craft diplomacy in our region. Australia is part of the WCC-Asia Pacific Region, which is by far the largest. Dr Ghada Hijjawi-Qaddumi was confirmed as President for her second term. Dr Ghada brings an inclusivity and rigour to the role, not to mention her generous support for the Online Encyclopedia of Crafts in the Asia Pacific Region, which promises to be an important legacy. The South Pacific sub-region is represented by myself and Lindy Joubert. It’s not always an easy fit. In some ways, our craft culture has more in common with the studio crafts in Europe and North America than the more traditional practices in Asia. But the dualism of tradition and modernity is a powerful dynamic of the WCC-APR. It is a shame that more Australians didn’t travel to witness this gathering—there was a major contingent from Bangladesh. But it is expensive for us to fly from across the Indian Ocean and the information about hotel bookings was less than clear. It’s worth checking the Garland calendar for regional craft events that are closer to hand. It is wonderfully uplifting to feel part of such a diverse community. This becomes ever more precious in a time of growing isolationism and cultural phobias. The WCC-APR board resolved to modernise the organisation through development of a communication strategy. This is aimed particularly at the next generation who access most of their information by smartphone. As we saw with the recent Sydney meeting, there is also potential for “crowd-sourcing” in enabling more active involvement in the organisation. The social media platform developed by our Iranian hosts provided a model for this. So expect more action now from the World Crafts Council—from everyone, hopefully including you. Thank you Iran for your commitment to the world of craft. Kevin Murray, Secretary, World Crafts Council – Australia.